When Luckett's (1980a) book on tree shrews was published, plesiadapiforms were considered by all the contributors primitive primates. This was a relatively broad, though not unanimous, consensus. It is very interesting to examine how the elimination of the Plesiadapiformes from primates affects our interpretation of certain characters. Surprisingly, this elimination renders a whole series of derived characters possible synapomorphies of tupaiids and primates. Figure 5 illustrates how the informative part of a cladogram of Luckett (1980a) can be reinterpreted simply in favor of a close tupaiid-primate affinity. A simple redrawing of the cladogram without imposing the Plesiadapidae in primates leads to a more parsimonious solution (Figure 5B, with 4 convergences instead of 5). The solution chosen by Luckett was based on the assumption that Plesiadapidae had a petrosal bulla, and this character had to be given a high weight in the phylogenetic analysis, a procedure one would be willing to endorse. However, since then it has been shown convincingly that the Paromomyidae do not have a petrosal bulla (Bloch and Silcox, 2001; Kay et al., 1992), and as a consequence, the closely related and extremely similar Plesiadapidae very probably also do not have a petrosal bulla. This new information renders a tupaiid-primate affinity quite well supported (Figure 5C). Figure 5. The informative part of the cladogram published by Luckett (1980b, Figure 5) is shown as published by him (A), and reinterpreted in a more parsimonious way favoring tupaiid affinities for primates (B). There are four convergences in B, cf. six in A. However, (A) was chosen because character 1 was correctly believed to be highly significant. In C, the reinterpretation of character 1 (see text) confirms the tupaiid affinities of primates from this simplified data set. Such simple reinterpretation shows that adding or subtracting one or two characters can change a phylogenetic hypothesis, rendering a formerly favored hypothesis weak, whereas establishing good characters is much more important if phylogenetic interpretations are to be well grounded. Characters are from those utilized by Carlsson (1922). They are shown in primitive state (open square), derived state (black square), and intermediately derived (obliquely-lined square). 1: Petrosal wing of bulla minute or absent (Pr) or forming virtually entire bulla (De); 2: Foramen rotundum confluent with (Pr) or distinct from (De) sphenoidal fissure; 3: Fibular facet on calcaneus prominent (Pr) or reduced or absent (De); 4: Sustentacular facet of astragalus separate from (Pr) or continuous with (De) navicular facet; 5: Ectotympanic exposed at least partially at lateral margin of bulla (Pr) or "intrabullar" (De); 6: postorbital processes of frontal and jugal absent (Pr) or postorbital bar complete (De); 7: Jugal (zygomatic) foramen absent (Pr) or present (De); 8: Fibular crista of astragalar trochlea subequal (Pr) or higher (De) than tibial crista. 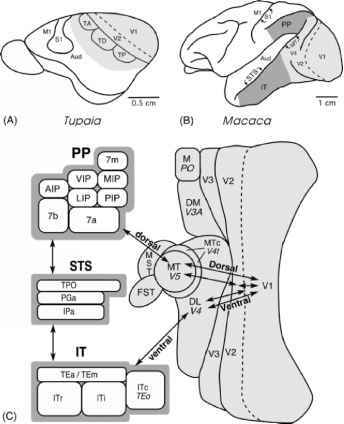 synapomorphies of tupaiids and primates. 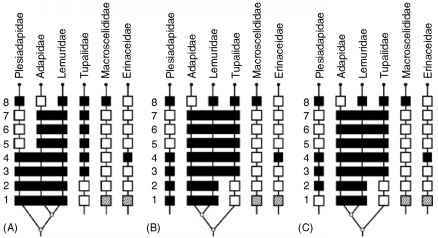 A series of potential synapomor-phies between tupaiids and primates appear from these studies because of the removal of plesiadapiforms from primates. It is beyond the scope of this chapter to make a complete reappraisal of all those characters. However, after discarding those characters for which the preceding authors disagreed or those which now appear as likely archontan traits, briefly listed in the following are the cranial and soft anatomical characters which seem to be still valid, including those proposed in more recent studies. The tarsal characters are considered in the next section. 13. Volar skin with serial papillary ridges ("finger-prints," Lemelin, 2000); low value because present in other mammals, however, absent in Insectivores; could be valid within archontans. It is clear that some of these characters have a rich history of study, including for example, the bony canals around the arteries and nerves in the middle ear. The latter were sometimes interpreted as a single character (for the presence of bony canals), but subsequently portions of canals and osseous derivation were taken into account (opening up the difficult issue of possible phyloge-netic replacement of one bone by another, as for the bulla). The number of characters represented here is not clear. The interpretation of the bulla is difficult; its petrosal composition in primates as opposed to essentially entotym-panic in tupaiids has often been regarded as an obstacle to tupaiid-primate ties. However, the existence of a petrosal part in the tupaiid bulla may well signal a common heritage with primates, as hypothesized by Novacek (1980). Other characters on the above list, more recently suggested, may be shown in the future to be convergent for tupaiids and primates, as was the aphaneric ecto-tympanic (intrabullar, not seen in ventral view, condition unique in tupaiids and primitive strepsirhines among eutherians, Cartmill and MacPhee, 1980; but likely convergent because of the probable absence in the ancestral primate morphotype). Even if some characters were to be discarded in the future, the list contains several important and very consensual synapomorphies. It is noteworthy that, in their reappraisal of basicranial characters based on onto-genetic studies, Wible and Martin (1993) concluded that: "If euprimates share a special relationship with any archontans, it is with scandentians based on the basicranial evidence. Both have an enlarged tegmen tympani that roofs the entire middle-ear ossicular chain, and there are further unique resemblances in the tegmen tympani of lemuriforms and scandentians." In sum, there is strong evidence in support of tupaiid-primate affinity in basicranial characters, including tegmen tympani and carotid circulation characters. There are characters linked to the crucial primate orbital apomorphies, the complete postorbital bar, enlarged optic foramen suggesting larger eyes, associated with some reduction of the olfactory bulbs (however, Ptilocercus relies less on vision and more on olfaction than tupaiines do; Le Gros Clark, 1926). These visual characters should be confirmed or questioned by further studies of the eyes of living forms and the neural characters linked with optic function (see Ross, Preuss, this volume). It has been mentioned that other mammals did evolve a postorbital bar; however, what is remarkable in the case of tree shrews is that they are small "insectivore-like" mammals with a diverse group of primitive forms, which must have an ancient origin. This in turn suggests that their acquisition of a postorbital bar was very ancient, early enough to possibly signal common ancestry with primates. The beginning of a reduction of the number of incisors in tupaiids could also pertain to the global transformation of the face, possibly homologous with primates. Added to these characters is a series of other, more isolated characters, proposed by Novacek (1980), Kay et al. (1992), some of which might well turn out to give a real phylogenetic signal. Despite the differences between the nocturnal or crepuscular Ptilocercus and the diurnal, more visually evolved tupaiines, the cranial evidence in favor of a close tupaiid-primate affinity appears impressive.